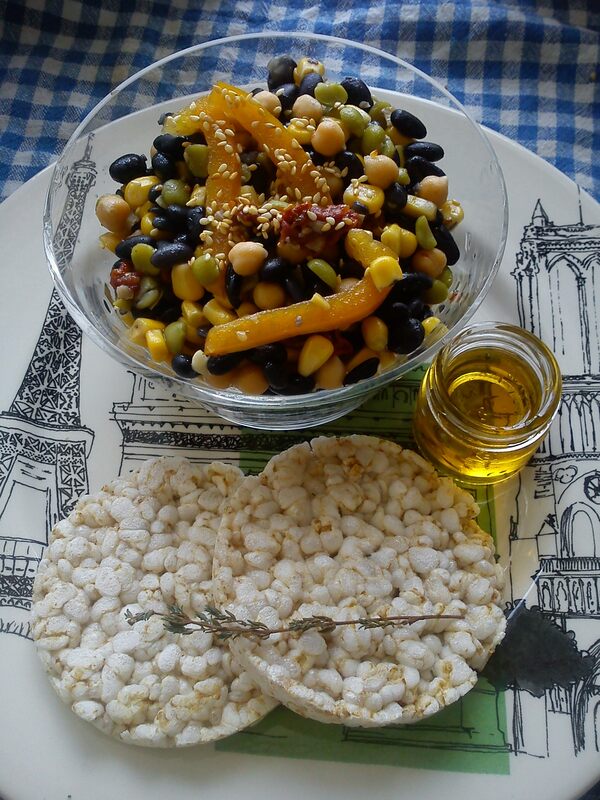 ½ Chick peas tin – 100grs of green lentil (preferably dry) – or half a tin – 100grs black kidney beans (preferably dry) – or half a tin – 1 small tin sweet corn – Toasted sesame seeds (1 table spoon) – Sundried tomato (5 pieces) – Salt & ground thyme – 2 Table spoons of garlic flavoured olive oil. You will get this if you buy a jar of garlic in Olive oil. This dish is great for anyone trying to stay way from meaty stuff. It has no dairy or ingredients of animal origin. It is great if you are trying to cleanup your system. 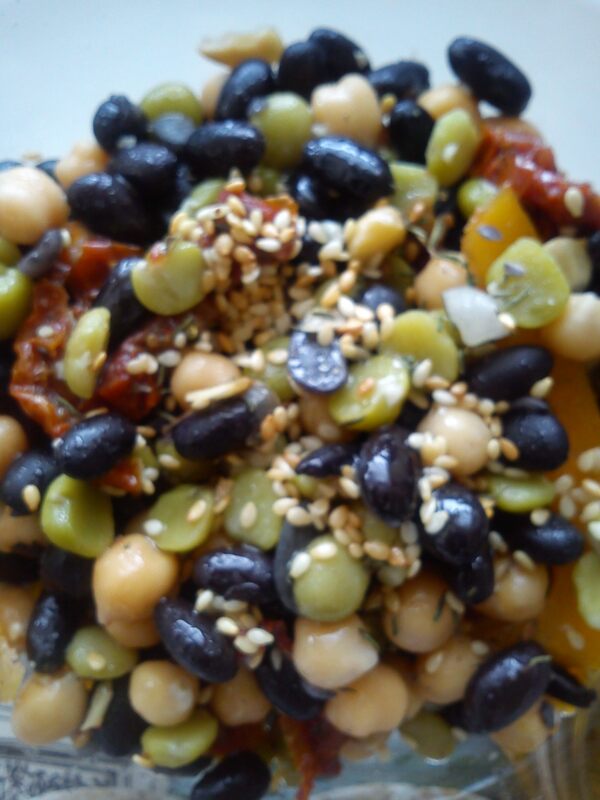 If you are thinking of making this dish, it is best to use dried bean & lentils. This is just because they remain firm after cooking compared to the tinned beans for example. And they maintain their colour, plus it works out cheaper on the quantity purchased. And you just cook the quantity you need for the dish that you are making. If using dry beans and lentils start by soaking them for 12 hours or more… What? Tasty stuff takes time so get on with it! After soaking rinse them out. Put them to boil in salty water for about 30 minutes minimum. When cooked to your taste. Drain and leave aside. Open the tin of sweet corn, and half a tin of chick peas, rind them out under running water. Take the sundries tomato slices and cut them as small as the beans be about the size of the beans. Roast the sesame seeds until slightly brown. Now all you have to do is mix all the above in a bowl, with a pinch of salt and grounded thyme. Drizzle a bit of garlic flavoured olive oil. Et voila! It is ready to serve. This can be served with fresh baguette or rice cakes like mine; as a starter or main meal. This entry was posted in Main meals, Uncategorized and tagged Bean, Chickpea, Garlic, Lentil, Olive oil, Pulse, Salad, Sesame, vegan. Bookmark the permalink. ← Mustardy Lentils soup – Soup served with hard baguette.